For the city in Colorado, see Pueblo, Colorado. For other uses, see Pueblo (disambiguation). In the Southwestern United States, the term Pueblo refers to communities of Native Americans, both in the present and in ancient times. The first Spanish explorers of the Southwest used this term to describe the communities housed in apartment structures built of stone, adobe mud, and other local material. These structures were usually multi-storied buildings surrounding an open plaza. The rooms were accessible only through ladders lowered by the inhabitants, thus protecting them from break-ins and unwanted guests. Larger pueblos were occupied by hundreds to thousands of Pueblo people. Various federally recognized tribes have traditionally resided in pueblos of such design. The word pueblo is the Spanish word for "town" or "village". It comes from the Latin root word populus meaning "people". On the central Spanish meseta the unit of settlement was and is the pueblo; which is to say, the large nucleated village surrounded by its own fields, with no outlying farms, separated from its neighbors by some considerable distance, sometimes as much as ten miles [15 km] or so. The demands of agrarian routine and the need for defense, the simple desire for human society in the vast solitude of, dictated that it should be so. Nowadays the pueblo might have a population running into thousands. Doubtless they were much smaller in the early middle ages, but we should probably not be far wrong if we think of them as having had populations of some hundreds. Pre-Columbian towns and villages in the Southwest, such as Acoma, were located in defensible positions, for example, on high steep mesas. 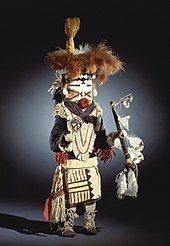 Anthropologists and official documents often refer to ancient residents of the area as pueblo cultures. For example, the National Park Service states, "The Late Puebloan cultures built the large, integrated villages found by the Spaniards when they began to move into the area." 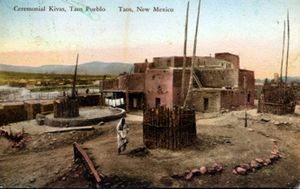 The people of some pueblos, such as Taos Pueblo, still inhabit centuries-old adobe pueblo buildings. Contemporary residents often maintain other homes outside the historic pueblos. Adobe and light construction methods resembling adobe now dominate architecture at the many pueblos of the area, in nearby towns or cities, and in much of the American Southwest. In addition to contemporary pueblos, numerous ruins of archeological interest are located throughout the Southwest. Some are of relatively recent origin. Others are of prehistoric origin, such as the cliff dwellings and other habitations of the Ancient Pueblo peoples or "Anasazi", who emerged as a people around the 12th century BCE and began to construct their pueblos about AD 750–900. The SMU-in-Taos Research Publications collection contains nine anthropological and archaeological monographs and edited volumes representing decades of research, primarily on Pueblo Indian sites near Taos, New Mexico, including Papers on Taos archaeology, Taos Archeology, Picuris Pueblo through time: eight centuries of change in a northern Rio Grande pueblo and Excavations at Pot Creek Pueblo.